It was enlightening for us making music with composer and sho player Tamami Tono, koto player Ryuko Mizutani and shakuhachi player Ko Umezaki. GABE’s producer Steve Epstein had introduced me to Ko as they had worked together on one of Yo-Yo Ma’s ‘Silk Road’ projects. Through Ko, I was introduced to Tamami in a concert at a Japanese cultural center in downtown Manhattan. Tamami’s music was intriguing, as was the instrument she played—the sho. Unlike any instrument I had seen or heard, the sho looked like a tiny church organ built in miniature. To produce the sound, the player gently blows through for one set of notes and inhales for another, much like the harmonica. The sound Tamami made on the sho was divine and, as I drove back from Manhattan that evening, I could already hear the sonority of muted brass with the ‘reedy’ sho. I emailed Tamami the following week in Tokyo and asked if she would write something for GABE. Over the following weeks we threw different ideas around especially in regard to instrumentation. We finally settled on a trio of sho, shakuhachi and koto, with a trio of horn, trumpet and trombone to balance the softness of the Japanese instruments. “There is an island in the eastern edge of the Eurasian continent which, in the 13th century, Marco Polo introduced to Europe as the ‘Golden Island’. Today, the island is called Japan—a country where traditional art and nature survives as one of the worlds’s cherished cultural assets. Kei ‘Scenes of Spirits’ is inspired by the beauty and nature of Japan. Each movement has the theme of the four seasons—‘Ka, Cho, Fuh, Getsu’ (Flowers, Birds, Winds and Moon) which are symbolic words representing how Japanese people feel and see the four seasons. You can find ‘Ka, Cho, Fuh, Getsu’ reflected in Japanese arts, paintings and poems, and in traditional books such as the “Manyoshu Tanka Collection” and “The Tale of Genji”. I have based the composition of Kei ’Scenes of Spirits’ on traditional Gagaku methods. Gagaku being the term used for the music and culture of the ancient Japanese Court dating back to the 6th century. The tradition of ‘Kei’, lies in the combination of two aspects of nature—that which we see and feel directly, and that which is created inside the human spirit, and subsequently expressed in words, music and culture. It is both the image of nature, and the imagery nature creates, which comes and goes in our minds when in a spiritual garden. 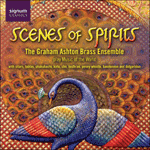 In traditional Japanese music, especially Gagaku, the ancient perception of Japanese nature is strong, and it has been a great pleasure to have this tradition bring ancient Japanese musical instruments and modern brass together, especially with such a group as the Graham Ashton Brass Ensemble”. There are two unusual techniques Tamami requires Ann, Jim and me to use in Kei ‘Scenes of Spirits’, one is sliding up to and down from notes to imitate the portementi of the shakuhachi—the other, is the use of ‘mulitiphonics’, where the player sings one note whilst playing another to produce either tonality or dissonance. Sometimes the dissonant ‘mulitiphonics’ are so close that you can hear an extraordinary oscillation of sound determined by laws of physics when notes are in juxtaposition.